Stanford sailing is supposed to be in a rebuilding year. The Cardinal graduated one of the top collegiate recruiting classes of all time at the end of last season, and was predicted to drop considerably from the No. 1 ranking it earned during the 2013-14 season in the face of strong competition from a number of East Coast programs. The fall was expected to be so precipitous that Stanford was ranked outside the top 10 in Sailing World Magazine’s first set of national rankings for the season, the first time that that had occurred in recent memory. These lowered external expectations certainly did not impact the high standards of the Stanford sailing team, however. After a strong fall season, the Cardinal are back up to No. 5 and are now ranked No. 3 in the team race standings, an impressive mark for a team that just lost many of its starting skippers. 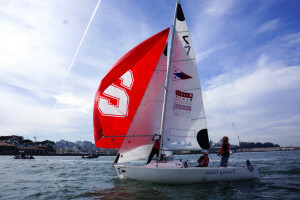 Stanford earned high finishes at both of the national singlehanded championships as well, with senior Sally Mace placing sixth in the women’s division and freshman Luke Muller just barely getting edged into second in the men’s division last November. Muller is one of the top singlehanded sailors in the country at any level, and should be a force for the Cardinal for years to come. The most important championship regattas, namely the Team Race Nationals, Coed Nationals and Women’s Nationals, are still to come, however. These events will take place in late May and early June, and Stanford will spend most of the time between now and then practicing and qualifying for these ultra competitive events. The team race event also features a format relatively unique to sailing, which stresses both offensive and defensive sailing skills. While the coed nationals and women’s nationals are relatively analogous to a track race in which contestants from one school face off with contestants from all the others, a team race is more like a direct dual between two different programs, each fielding three boats per race. Contestants can help their side in these events either by breaking out to large leads or by knocking back their opponents so that their teammates can build advantages of their own. In order to qualify for these all-country regattas, Stanford first must finish near the top of its conference, the PCCSC. Fortunately, the Cardinal are well-positioned to dominate in this division. Stanford hasn’t slipped in the conference championships since 2009, and the team has looked a cut above the competition so far this season. UC Santa Barbara and Hawaii have made things interesting in phases, but both schools lack the Cardinal’s consistency and depth. In a team race tune-up that the Cardinal hosted in late February, neither Santa Barbara nor Hawaii could win a single race against either Stanford’s A or B team. The Cardinal’s skippers rolled to a 1-2 finish in the event, a strong performance against some of the conference’s top talent. East Coast competitors offer a whole other caliber of competition, however. Many of the sailors at these schools expect to go on to Olympic campaigns and world championships after they graduate. Early indications have shown the Cardinal can hang with even the best of these programs, although the most important tests are still to come. Stanford’s sailors have to spend hours on planes in order to face off against these top-level opponents, an unfortunate geographic disadvantage over many of the other programs that have quality competition a short drive away. This weekend, however, the Cardinal get to stay close to home. Stanford will sail against a number of conference opponents as it hosts the Cardinal Invite and Bryson Women’s regattas. Pride is mainly on the line this weekend, although the event will also prove a key chance to practice against the competitors it will have to face in the conference championships in early May. Look to see the Cardinal at the Stanford Sailing Center in Redwood City this Saturday and Sunday as they continue their campaign to earn their first major national championship.